The Chulu East Peak climbing is an adventurous travel to region above the Manang valley to the mountain called Chulu East of 6584 meters elevation above sea level. The Chulu mountain region is encompassed by Dhaulagiri, Manaslu, Tilicho Peak, Glacier Dome, Annapurna Himalaya, Gangapurna etc. The Chulu East Peak is categorized as non-technical mountain and is a straightforward climb to the top but it requires knowledge on mountaineering like using climbing equipment, crampons, ice axe, tying knots and climbing ropes etc. 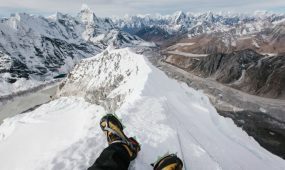 The Chulu East Peak climbing mostly comprises of walking with roped together and alert glacial ice mass crossing which requires good health and some climbing experience. 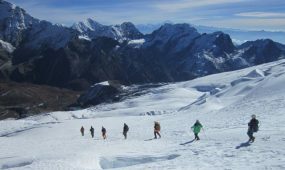 The Chulu East Peak climbing is worth climbing for its fascinating scenery of encompassing region and Himalayas accompanied by close up views of Annapurna Himalayas. The trekking trail to Chulu East Peak is full of diverse nature, beautiful landscape, elegant farming lands, delightful forests of oak and rhododendron, traditional villages, antique sanctuaries etc. The Chulu East Peak climbing begins from Besisahar of Lamjung district following the trails of Annapurna Circuit along the Marshyangdi River Valley until the village of Chame. The travelers from Chame traverse through the villages of Humde and Julu landing on Yak Kharka. The travelers from Yak Kharka follow the trekking trail to Chulu East Base Camp at 4200 meters. 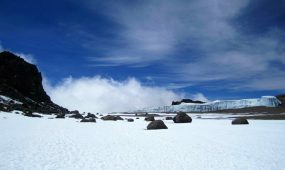 The Chulu East Base Camp is resided along a glacial deposit and a ridge that separates Chulu East and Chulu Far East Peak. The North-East Ridge is the normal route to ascend the top which a healthy climber finish in one day and get back to base camp. The returning travelers from Chulu East Base Camp descend towards Manang region where they can get rest and take vehicle to Kathmandu city. Day02: Rest and prepare day for assignment & briefing. Day 03: Drive from Kathmandu to Besisahar (823m.) which takes about six hours. Day 04: Trek from Beshi shahar to Bahundanda (1305m) and it takes about six hours. Day 05: Trek from Bahundanda to Chyamche (1430m.) which takes about six hours. Day 06: Trek from Chyamche (1410m.) to Dharapani (1860m.) and it takes about six hours. Day 07: Trek from Dharapani to Chame (2670m.) which takes about five and half hours. Day 08: Trek from Chame to Pisang (3100m. ), which takes about five hours. 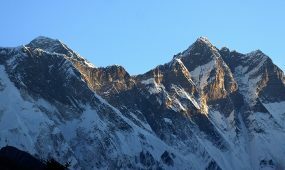 With Lamjung Himal (6893m) sparkling in the morning sun, you set off for Pisang. Day 09: Trek from Pisang to Ngawal (3305m. ), this takes about five hours. Day 11: Trek from Ngawal, to Chulu Base Camp (3910m. ), which takes about six hours. Day 13: We do acclimatize here if we feel uncomfortable. If we feel well, we go for attempting the summit. Day 14: Today, we ascent the summit ascent and return to the Base Camp. Day 17: From Chu Ri Lather, we trek to Thorong Phedi (4510m). Day 19: Trek from Muktinath to Jomsom via Kagbeni(2895m.) which takes about five hours. Day 22: Full Day sightseeing in Kathmandu valley (Durbar Square, Swoyambhunath, Boudhanath & Pashupatinath) and Nepalese cultural program with farewell dinner in the evening. Day 23: Final departure ,or alternative Join other activities. Day 22: Full Day sightseeing in Kathmandu valley (DurbarSquare, Swoyambhunath, Boudhanath & Pashupatinath) and Nepalese cultural program with farewell dinner in the evening. Camp shoes (sneakers and/or sandals) Gaiters for hiking in winter to the base camp. Large plastic bags – for keeping items dry inside trek bag. Daypack (approximately 2500 to 3000 cubic inches). Ear Plug (who know some people on group are snoring). The term “Trekking Peak” is a commonly misunderstood colloquial term which may refer to a variety of types of peaks in the Himalayan Region. 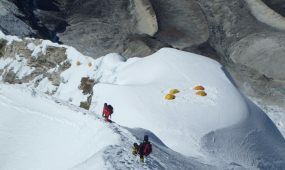 The term is most often associated with Group “B” NMA Climbing Peaks classified by the Nepal Mountaineering Association or easier. Some may use the term “Trekking Peak” to solely describe peaks requiring little to no technical climbing experience. 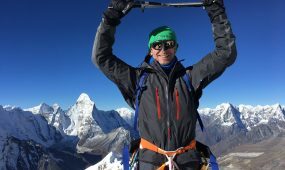 Others may use the term to describe all mountains regulated by the Nepal Mountaineering Association including Group “A” NMA Expedition Peaks which may require considerable difficulties and technical climbing skill.